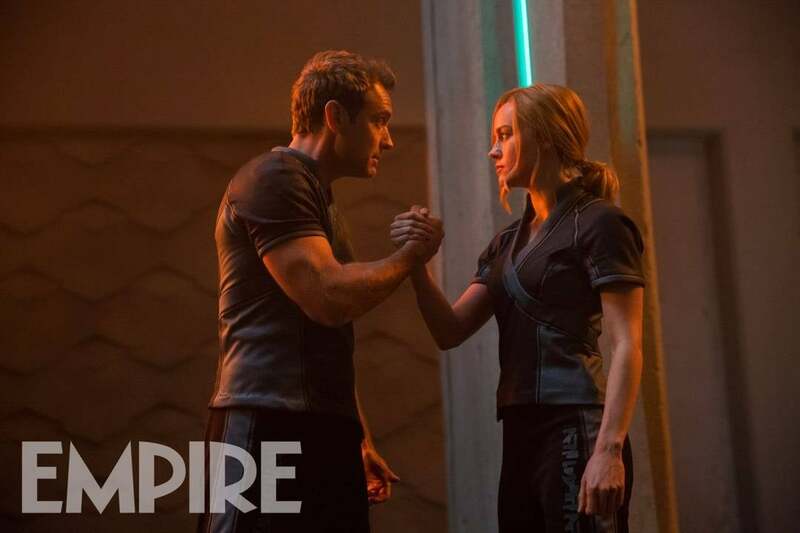 While we still don't know exactly who Jude Law is playing in Captain Marvel, a new photo has surfaced that highlights his mysterious relationship with Brie Larson's titular hero. Ahead of its massive 2019 preview issue that arrives later this week, Empire Magazine has unveiled the new photo online. In the image, Law's character is seen facing Captain Marvel, likely as a part of some sort of training exercise. There are several theories floating around online as to who Law could be playing in the movie, but none of them have been confirmed to this point. The role is being kept such a big secret that Law wasn't even allowed to tell his children which Marvel character he was playing. "I can't tell you anything," Law said during an appearance on The Late Late Show with James Corden. "I can tell you that Brie Larson plays Marvel. Captain Marvel." When his kids came out to visit the set, Law had to keep the secret from them as well. So, unless you're actually involved in the movie itself, Jude Law's character remains a mystery. A leaked image of Funko POP packages seemed to confirm that Law was playing the character Yon-Rogg, but the actual packages that were released had seemingly changed the name. In addition to Brie Larson and Jude Law, Captain Marvel stars stars Samuel L. Jackson, Ben Mendelsohn, Djimon Hounsou, Lee Pace, Lashana Lynch, Gemma Chan, Algenis Perez Soto, Rune Temte, McKenna Grace, Kenneth Mitchell, and Clark Gregg. Who do you think Jude Law is playing in Captain Marvel? Could he end up becoming one of the biggest villains of the film? Let us know your thoughts and theories in the comments below! Captain Marvel is set to hit theaters on March 8, 2019.